In a large mixing bowl, combine the butter, shortening, sugar, baking powder, baking soda, spices, salt, vanilla, and rum, beating until smooth. Add the eggs one at a time, beating well after each addition; then add the boiled cider or syrup. 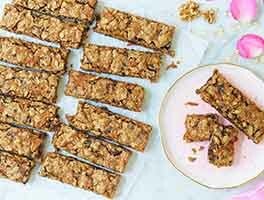 Stir in the fruit and nuts, then the flour and oats, beating gently until well combined. Drop balls of dough onto the prepared sheets, leaving about 2" between them; see "tips," below. Bake the cookies until they're just barely set on top: about 12 minutes for the small cookies, 13 to 14 minutes for the medium cookies, and 16 minutes for the large cookies. Remove the cookies from the oven, and cool them on the baking sheets, or transfer them to a rack to cool. 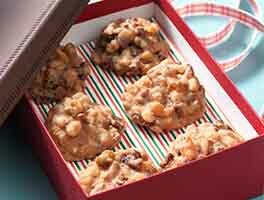 Store cooled cookies at room temperature, well wrapped, for 3 to 4 days; freeze for longer storage. How large should you make these cookies? Up to you. A tablespoon cookie scoop will make traditional 2 1/2" cookies. 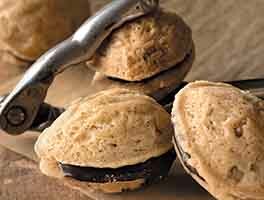 A heaped scoop of dough, using a tablespoon cookie scoop (3 tablespoons, about 2 ounces), will make 3 1/4" cookies. A muffin scoop (1/4 cup) will make big 4" cookies, suitable to wrap individually and sell at a bake sale. Don't have any whole wheat flour in the house? Feel free to substitute all-purpose flour. Made these cookies VEGAN (my wife and I are not but our daughter and granddaughter are) with vegan "butter" and flax-seed mix for the eggs. They were still pretty darn good. It was very easy to overbake which makes them pretty hard when the cool. I knew better by the second batch and only left the (small) cookies in for 10-11 mins. When the recipe says to bake "until they're just barely set on top" they mean it, with the emphasis on "barely." My granddaughter thought they were GREAT! These are very good &amp; really versatile. They keep their shape &amp; don't flatten out which I like. I didn't have any alcohol so I did what another reviewer suggested &amp; just doubled the vanilla. Also didn't have cider so I used orange juice. My husband doesn't like raisins so I used a mix of dried cranberries, white &amp; dark chocolate chips, walnuts, and candied ginger &amp; threw in a tablespoon of chia seeds. 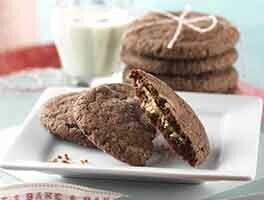 I like the idea of a "healthier" cookie &amp; this one has great flavor &amp; texture! 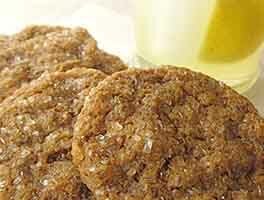 An oatmeal cookie that stands above the rest with its wonderful flavor. The spiced rum, cider and cranberry additions to the usual oatmeal raisin cookie ingredients give this recipe a heavenly complexity. I was skeptical but am sold, as is everyone who has tried one (and then had more!). Highly recommend! These are delicious! I think the boiled cider is what took them over the top. I already had a bottle from making the Caramel Apple Biscuit recipe and this was a great way to use some more of it. I didn't have the spiced rum so I left it out. I toasted my pecans before chopping them up and used unsweetened dried cherries in place of the cranberries, since that what I had. We like them a little firmer, so I stored them loosely covered which worked for me. I also made a half batch, used a #60 scoop and cooked for the recommended time. Don't be fooled into thinking they are underdone; take them out when they are still a bit soft on top and store them uncovered if you want them a bit firmer. I will definitely be making these again. I made this recipe EXACTLY as written with NO substitutions. 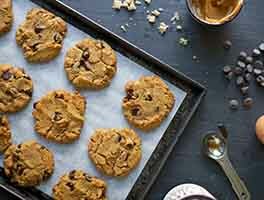 I am looking for the perfect chewy "bendy" oatmeal raisin cookie recipe. Unfortunately, this is not it if chewy & "bendy" are your desire. The texture is more cake-like, so they are soft, but they are not "bendy". The spices were also VERY subtle as others have indicated. I would try the recipe again & amp up the spices, but since this does not meet my texture requirement, I'm not going to take the time to do that. If you want a cake like cookie with a slightly dry crumb even when underbaked, this recipe may be to your liking. These cookies are a hit! I used just what I had in the house: all butter, cranberries instead of both raisins and cranberries, and maple syrup. The spiced rum, I plan on searching for next time I shop. I also used white choc. chips in place of the nuts. My kids loved it. Thanks so much for such a great recipe. King Arthur Flour is our favorite! King Arthur Flour you never disappoint me. Loved these cookies. Great flavor. Boiled cider really makes a difference. Very nice Cookies. I reduced brown sugar to 1 1/4 cups, with 2 Tbsp syrup, without any problem. Used 2 tsp cinnamon. I may bump up the ginger a bit next time also. I flattened them a bit after using hands to shape into a ball, the shape did not change or spread when cooking. I got 54 cookies and would double the batch if I had children at home. I use a stand mixer for all cookies. I am trying to make a 100% switch from processed cookies to homemade cookies, along with reduced sugar. These should work well. These were great! Never made a cookie with only brown sugar. The brown sugar gave them a slightly caramelized flavor. They spread out nicely without having to flatten them first. Will definitely be making these again! Made them with a muffin scoop. Baked for 15 minutes in convection oven set at 350. Thanks for the tip about flattening them. Used the back of a wet spoon to flatten the tops. Turned out beautifully. Not only a good looker, but tastes delicious.